Mauna Kea, a dormant volcano, is one of the highest island mountains in the world. 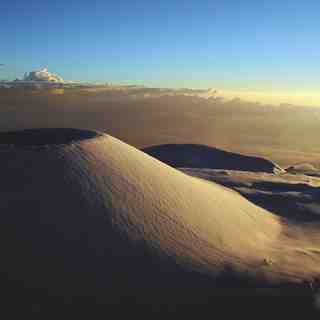 It is located on the main island of Hawaii along with its slightly smaller neighboring mountain, Mauna Loa (13,667 ft.). 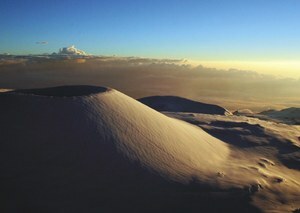 If Mauna Kea's height is measured from its base (18,000 feet below sea level), it surpasses even Mount Everest, and is the world's highest mountain (31,796 ft.). Although there is no historical record of Mauna Kea's eruption, geologic evidence suggests that the volcano last erupted around 1650, and eruptions are present in traditional Hawaiian folklore. According to legend, Mauna Kea and Mauna Loa were the domains of two opposing goddesses, Poliahu and Pele, respectively. Earthquakes and volcanic eruptions were produced from their violent rivalry. Lesen Sie 4 andere Beurteilungen ueber Mauna Kea oder geben Sie Ihre eigene Bewertung ab.